Historically, campuses have looked to their energy spend as a funding source to address deferred maintenance. Procurement strategies, performance contracts, and campus-wide conservation programs are all viable strategies. However, the backlog of deferred maintenance, specifically the needs of utility infrastructure and modernization, are often greater than the savings realized from these approaches. However, monetizing a campus’s infrastructure assets, a P3 financing option, offers a new funding strategy to address deferred needs and improve the campus environment. 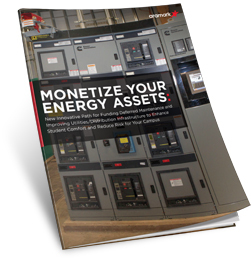 Here are answers to the most common questions asked about this innovative new approach to energy and utility asset funding. Complete the short form to get your copy of this insightful guide.